I like this cartoon. It reminded me of that old story about an infinite number of monkeys tapping away on an infinite number of typewriters, and how they would eventually rewrite all the great works of Shakespearian literature. Infinity is a big number. Someone, somewhere, is bound to write something worthwhile eventually. A little bit like the blogosphere perhaps. 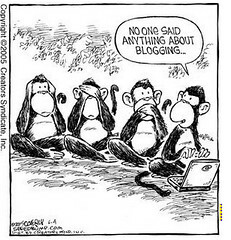 Monkey Business by Chris Betcher is licensed under a Creative Commons Attribution-ShareAlike 4.0 International License.